The Buffalo wireless PCMCIA card (WLI-CB-B11) consists of both LAN and radio functions. A wireless PCMCIA card is necessary for wireless communication between an AirStation access point and client PC. The WLI-CB-B11 is Plug-and-Play ready, features a compact antenna and offers a selection of 11 channels that can reduce network transmission load. Supports IEEE802.11b standard and sustains 11Mbps high-speed data transmission rate. Supports peer-to-peer communication or Infrastructure mode with any Access Point and up to 128-bit Wired Equivalent Privacy (WEP). 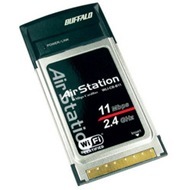 Buffalo's 802.11b Wireless CardBus PC Card Adapter is the best way to add Wireless Networking to your Notebook PC. 32-bit CardBus technology ensures optimal performance while the Diversity Antenna ensures the best wireless connection while you roam. BUFFALO WLI-CB-B11/WLI2-CB-B11 are based on the Realtek RTL8180 Family chipset.